The puzzle category is a unique Super Metroid category that requires the player to reach a particular goal within the game, according to certain rules and restrictions along the way. A puzzle is conceived and proven by a single player. From there, that puzzle is introduced in a race on SpeedRunsLive, where the competitors will not be able to view the details of the puzzle until the race starts. The author of the puzzle is typically the host of the race, unless the author asks someone else to host on their behalf. Puzzles tend to be challenging since it will require the player to perform a task they have never done before. It is not uncommon for puzzles to require the use of glitches not used in other runs. Because of this, many puzzles are not recommended for beginner players, or even intermediate players, since the scope of knowledge required normally goes beyond what a newer speedrunner to Super Metroid would know. Even a more advanced runner may not be able to complete a puzzle if the breadth of their knowledge about the game is weak. Puzzles generally allow for any glitch in the game to be utilized unless the rules of the puzzle specifically state otherwise. Keep in mind that these puzzles are (usually) designed based on NTSC and that some things that are possible in PAL (and not NTSC) may change the solution to the puzzle. Because of this, the use of NTSC is recommended but not required. The links underneath the "Date Released" column are the original SRL races of the respective puzzle. If a puzzle's description does not contain a link, then it means either everyone attempting the puzzle was not able to complete it and forfeited, or the link to its race could not be located otherwise. Occasionally there have been other challenges that were either not considered to be a puzzle or were never raced on SRL. These challenges/puzzles are listed with the other puzzle races but are not a part of the currently numbered Super Metroid puzzle races. If you'd like to make your own puzzle, you may. Anyone is allowed to make a puzzle, all you need is a unique idea and an image for you puzzle. Over the years, people making puzzles have had some trouble with some words. Some would interpret the words one way and others another. 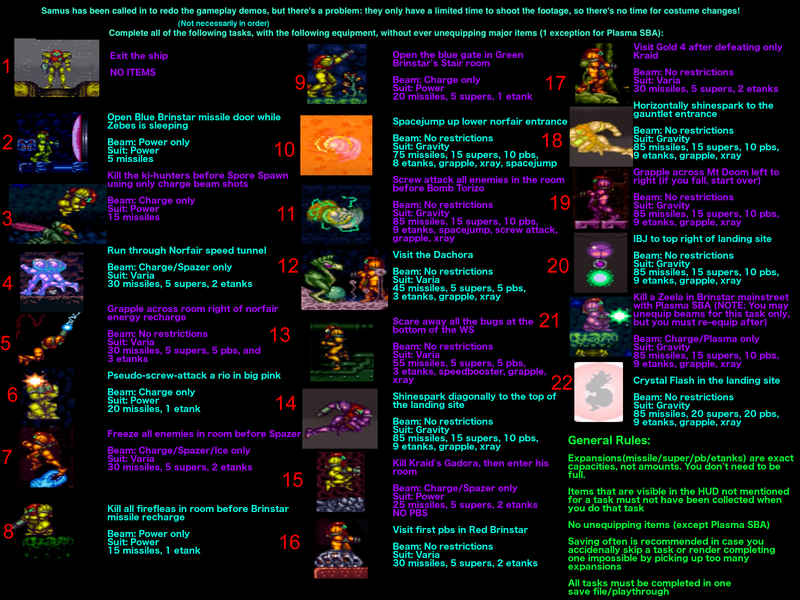 So to combat this issue, here is a dictionary for terms and what they mean for the purpose of Super Metroid puzzles (after #49). 44b Overcharge Backfire Foosda Medium 9/13/2015 A miscommunication led to there being two "44"s.
55 Reduce, Reuse, Recycle matrick Medium 7/3/2016 The flag is for US Independence Day. 59 Super Leakage crossproduct Medium 11/8/2016 Commentary Strictness regarding accidental Super usage is up to the discretion of runners and race moderators. 60 Auxiliary Power Kanzeon Easy 12/2/2016 Given the "matrick seal of approval"
70 Super Metroid Puzzle #70 crossproduct Easy 5/15/2019 Coming soon! N/A Gameplay Demos: Take 2! cardweaver Easy 5/6/2016 Previously unreleased. Here is a numbered version to make things easier if you so desire. N/A Really Innate Abilities foosda & matrick Insanity 10/26/2016 This is an unfair challenge, which is why it was released without a race. 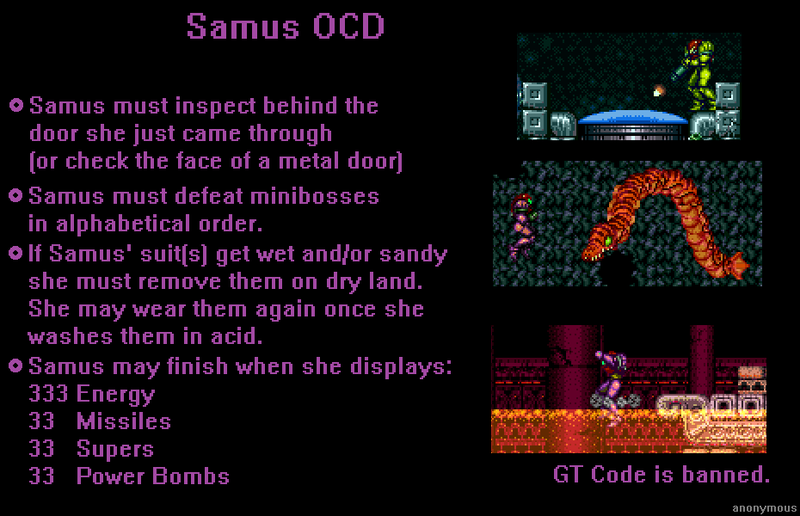 N/A Samus OCD Anonymous Medium 4/27/2014 Randomly found on imgur. Rule #1 is yet to be fully understood. It most likely means that you must shoot each door after going through it. This page was last edited on 13 April 2019, at 03:32.